Fourteen people were rescued from the 55ft race boat Bounder when her keel reportedly fell off two and half miles south of St Catherine’s Point off the Isle of Wight this afternoon. The crew were airlifted off safely and taken to Lee on Solent. None was hospitalised. The yacht reportedly sank after the rescue. The new yacht designed by Juan Kouyoumdian and owned by Chris Little, recently came third in class in the JP Morgan Round the Island Race and was lining up for a big season on the grand prix circuit. The brand-new Juan Kouyoumdjian-designed IRC 55 Bounder which was built by Goetz Custom Boats in Bristol, Newport Rhode Island lost her keel and capsized on Saturday while sea-trialing off St Catherine’s Point in 18-20kts of breeze. This new, sleek-looking racing machine was shipped across the Atlantic earlier this year and launched at the end of March in Portsmouth, UK commencing sea trials in preparation for the Rolex Fastnet Race and the Sydney Hobart. Because the new 55ft yacht draws a lot Robinson and team decided to head offshore and put her through her paces… here’s what happened: “We’ve recently changed the ballast round a little bit so we needed to head out and check the trim. We were sailing upwind when suddenly the boat captain – Anthony Haines – called for everyone to put on their lifejackets. Don’t quite know why but he must have had a sixth sense that something was about to happen. I handed one of the crew the helm so I could put on my lifejacket but just as we did that the boat started to heel excessively over a wave. I called for the main to be let out, then there was a huge bang and someone said ‘the keel’s gone’. “The boat started to capsize immediately, just like an Ultra 30 really. I hadn’t even got my lifejacket on. At this point, as she went over some of the crew went into the water. I climbed over the top and was able to get hold of the rudder. Some who’d gone over the top slid straight off again so there were three of us on the hull and rest in the water. Fortunately they all had their lifejackets on so we were able to grab them and pull them up over the transom. Kevin George managed grab a spinnaker sheet which everyone was able to hang on to. 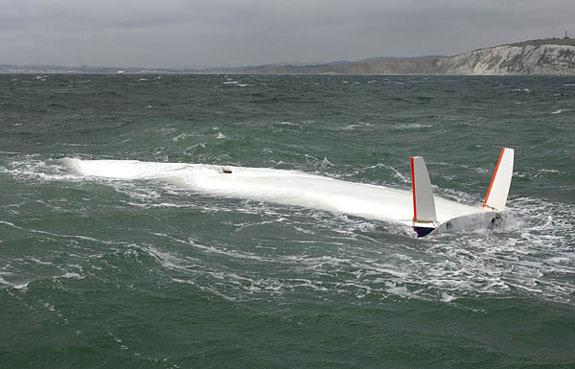 Although Robinson was unable to talk about the keel and the cause of the accident at this stage he did confirm that the yacht is still afloat and will hopefully, weather permitting, be salvaged as soon as possible. The coastguards are continuing to monitor her about 2.5 miles south-east of St Catherine’s Point but the strong winds are currently hampering salvage progress.